Greenhouse forms viewed from the north. The new greenhouse we’re building is a large open three sided shed which will be dividable into different configurations for housing animals during the winter while still giving them free access to the out doors as well as providing plant growing space. Greenhouse forms viewed from the east. A couple of weeks ago we poured the footers for the walls. We’ve been working on getting the form for the walls up. 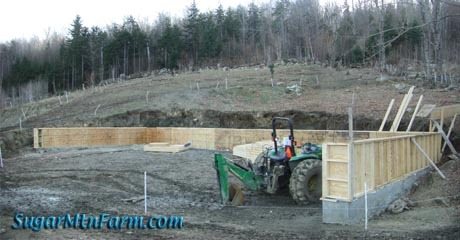 Yesterday and the day before I coverd the raising of the outer wall forms and the concrete flume. Next comes the iron work, the rebar that provides tensile strength in the walls. 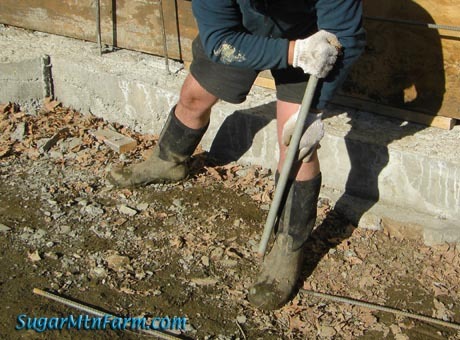 Concrete has excellent compressive strength, typically 3,000 psi. That’s 432,000 pounds or 216 tons per square foot. A square foot is about the space my feet take up – I weight 180 lbs. 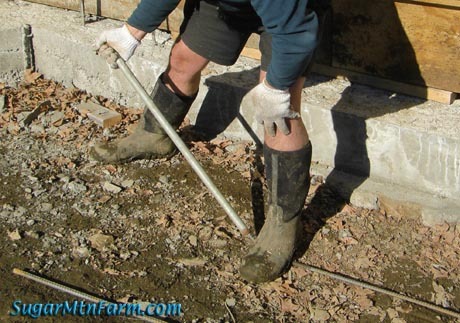 Concrete has a lot of compressive strength. While congrete does well under pressure it is weak under tension. Steel on the other hand has excellent tensile strength. Combine the two in either Reinforced Concrete (RC) like we’re doing here or Ferro-Cement (FC) like we did on the barrel vault style roof of our cottage and you have a very strong structure. Without the steel the concrete may fracture, shear and crumble. Greenhouse forms viewed from the south. The greenhouse is set into the bank of the hill in order to give it a lower wind profile and protect its back from the cold of winter. 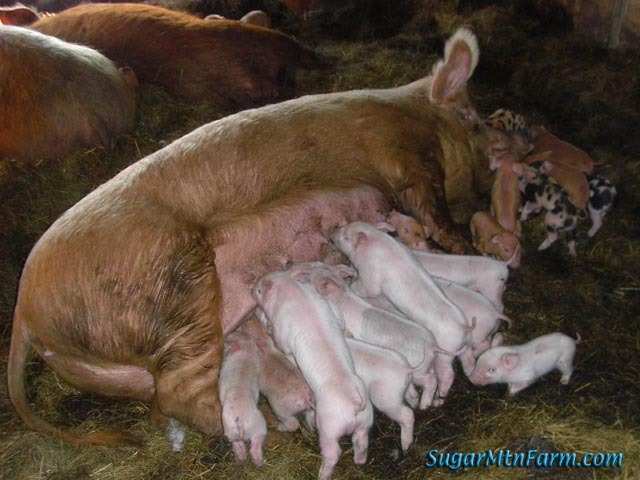 This is much like the early dens we built for our pigs that have served us for years. 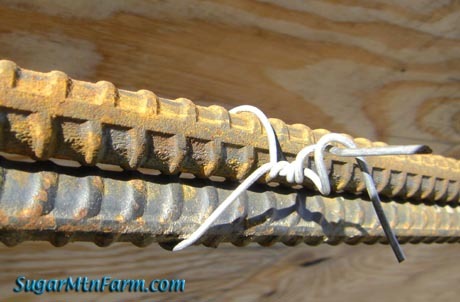 The rebar, or reinforcing bar, comes in 20′ long sections that are 1/2″ in diameter. This is refered to as #4 rebar. Each number represents 1/8th of an inch in diameter. #4 is what is readily available around here and works well for many applications. We also used rebar to build the hoops of our chicken coop. 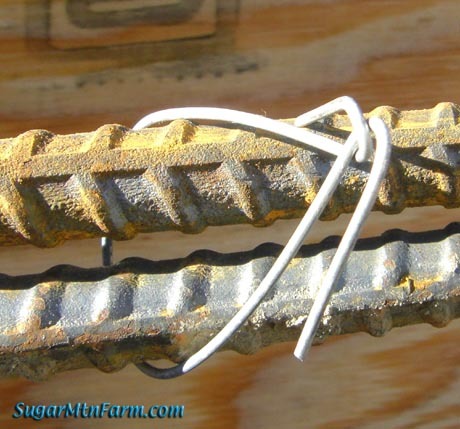 The photo above shows how to tie rebar. 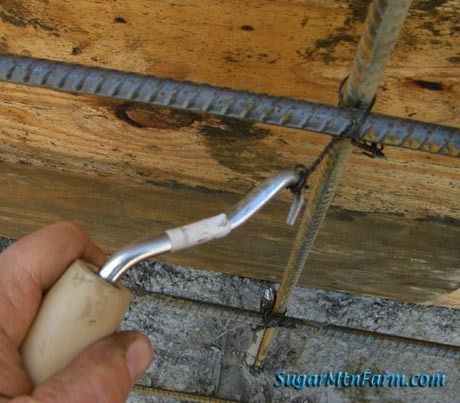 Wires are used to connect the bars securely together until the concrete sets around the steel. The tool in my hand twists the wires tightly. Careful not to over twist or you’ll break the wires. 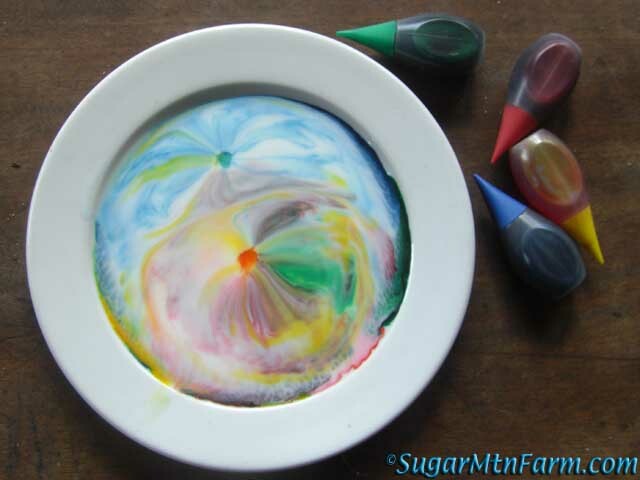 A trick is to pull firmly and twist slowly as you spin the wires together. It is important to get a tight tie. You’ll notice I do two ties, in opposing directions to get a secure connection between the pieces of rebar. 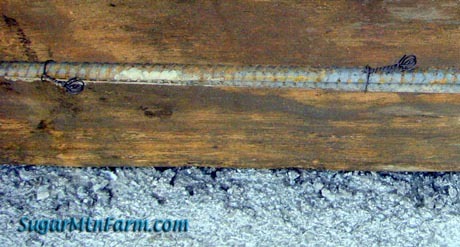 Splicing two long sections of rebar overlapped 18″ (36x diameter). 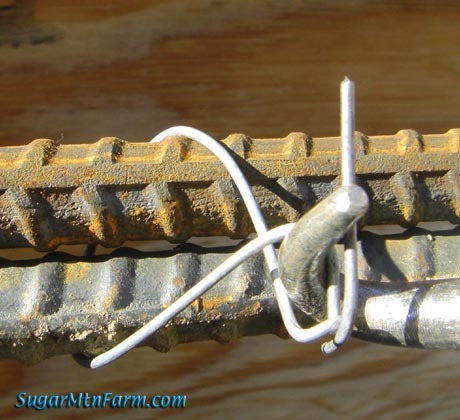 The premade rebar ties are more expensive than plain wire but well worth the 2¢ each cost. The tool is only about $5 and does a far better job than a pair of pliers or stick. If you’re going to be tying much rebar, get the ties and tool. Footer Rebar Stub Tied to Next Vertical Upright. 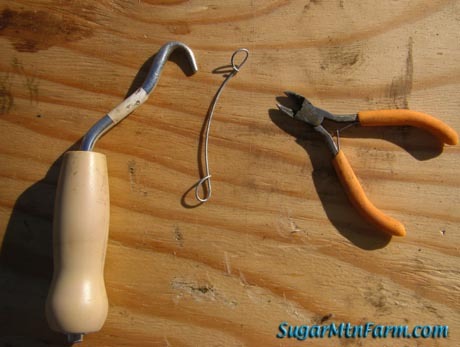 Spinner Tool, Homemade Tie, Nippers. If you run out of ties, as I did right at the end, you can make your own. A jig is the best way to do it. …and then tighten it. It works although it is not as fast as the ‘real’ thing. 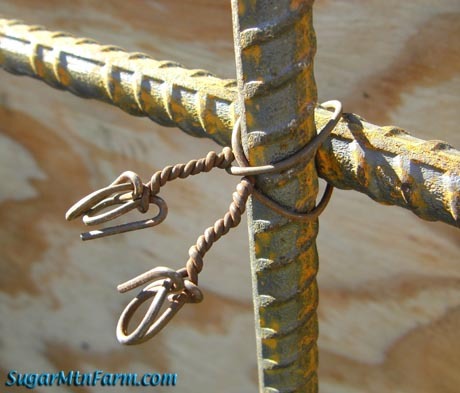 I’ve mentioned on other projects about bending rebar and people have often asked how. It’s really very easy. 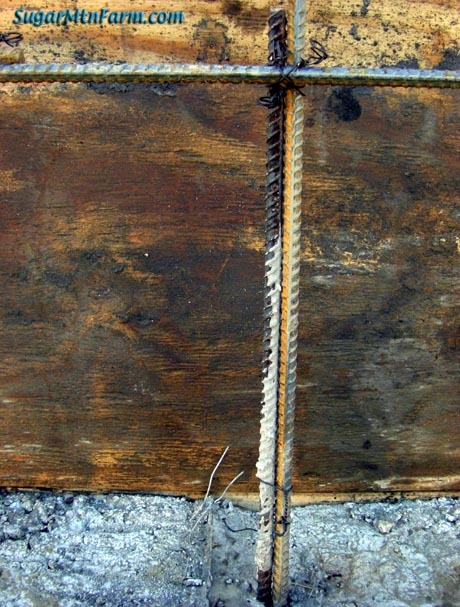 Rebar is soft iron and bends very readily, especially if you have a long length. 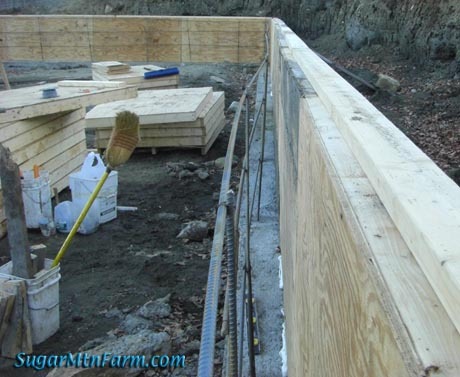 To make hoops for a hoop house simply place one end of the rebar section in a hole in the base of the structure. Then grab the other end and bend it down to the opposite side’s hole. The rebar will take on the new shape. See this article I write a long time ago for some visuals. 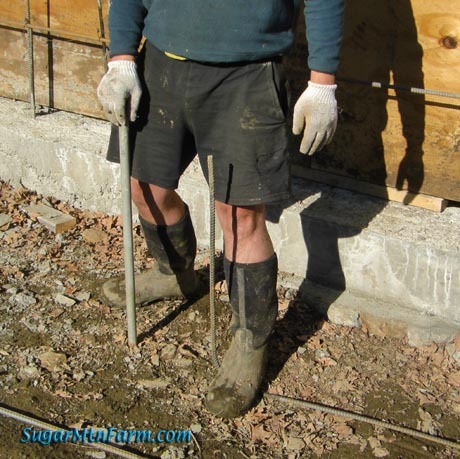 For shorter bends the rebar can be quite hard to manipulate. What you need is leverage. A section of steel pipe works perfectly. 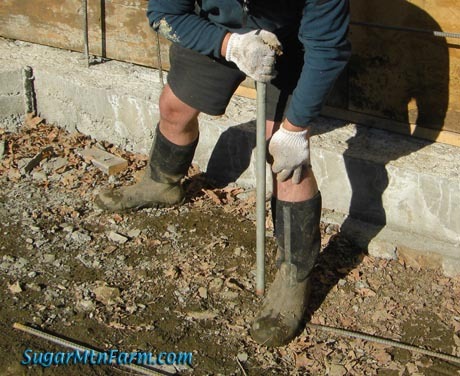 Put the end of the rebar into the pipe, slightly shorter than you want to bend, and then place your foot over the rebar on the ground at about the place you want bent. Pull upward on the pipe handle. 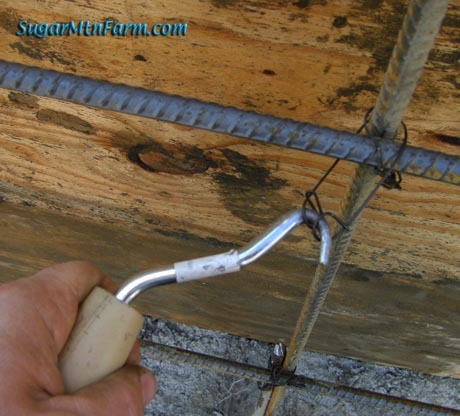 Pull past the angle that you want as the rebar will spring back a little bit. Relax back to the desired angle. Voila! Perfectly bent rebar. Using this technique you can even bend sections that are just a few inches long on one side. With two pipes you can get very small angles. Long view of finished steelwork. Wide Angle View of Greenhouse Forms. Next we need to put up the inner forms for pouring the walls. The weather’s been holding nicely and work is progressing quickly. 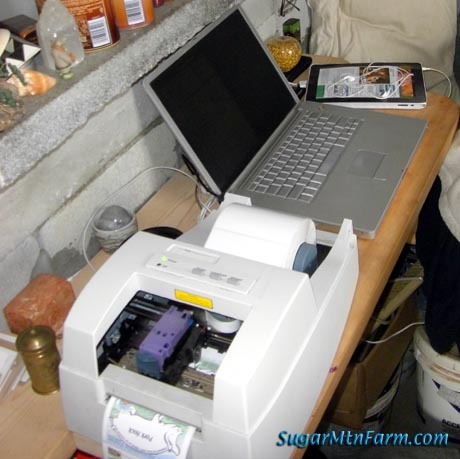 This entry was posted in Uncategorized and tagged Greenhouse. Bookmark the permalink. hey walter i plan to build a methane digester–currently last in my queue. what i’d like is for you to build one and work out all the bugs so i can copy yours. your planning skills and attention to detail are always a pleasure to witness. 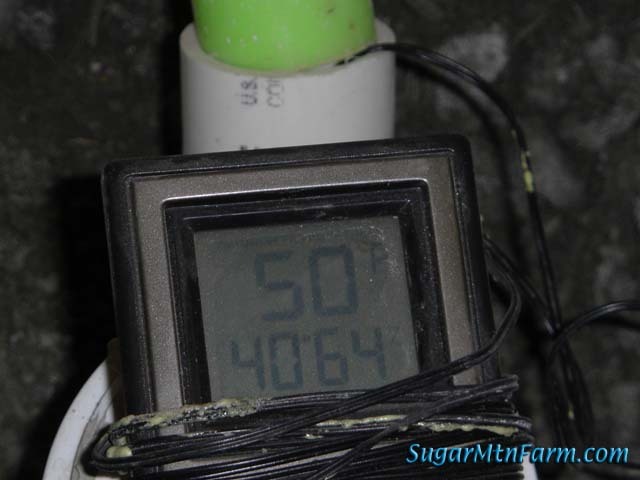 need a reason to build a methane digester? methane and natural gas are interchangeable. 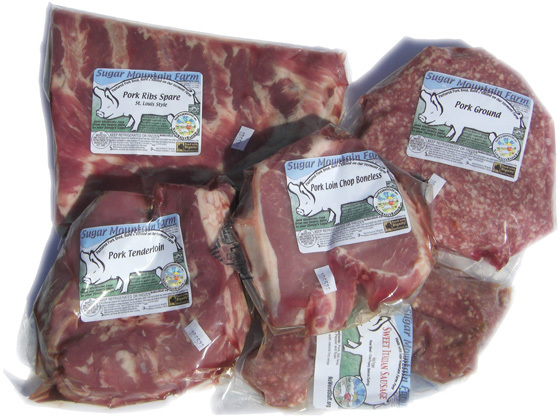 uses range from gas-oven-range, water heaters, natural gas generators, to compressed natural gas vehicles. any thoughts? 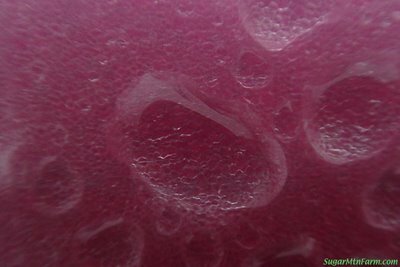 i have rough plans in my head involving a sloping trench, a sheet of black plastic formed into a tube, submerged inverted weighted tank as digester un-loader and pressurization tank. load the tube from the top with pig manure and digest then finished compost emerges out the bottom. i could draw it out if this peaks your interest? A methane digester is an interesting idea. I have considered this and studied various methane digester designs in great detail but came to the conclusion that I don’t want to do it. 1) Methane goes boom. It’s an explosive gas. I try to avoid such things if possible. I’ve read too many news reports of homes, businesses and winter heated tennis courts that exploded killing people, sometimes whole families. 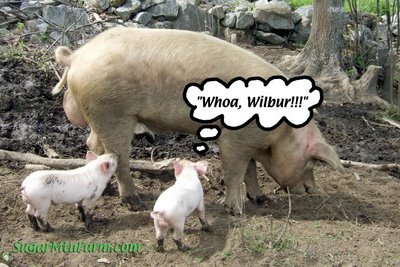 2) Methane pigs are very dangerous to enter, just like silos and manure pits. The gas kills people who go into them. This is an accident I would rather avoid. 3) We used natural gas to cook with and light our home for years. It gave me headaches. Bad ones. It also makes me feel like I have a sinus cold all winter long. 4) To make methane we would need to collect the manure. 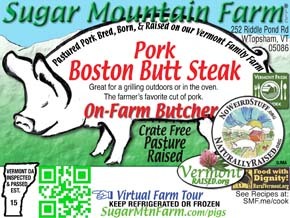 Our pigs, chickens and sheep distribute the vast majority of their manure over the fields. 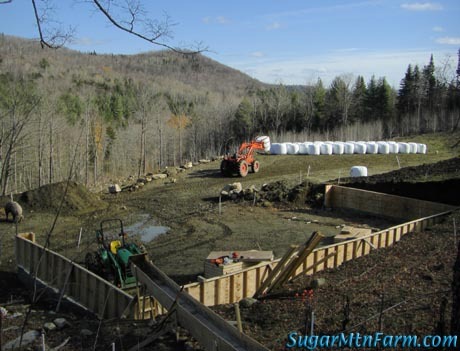 This would mean more work and confining the animals to be able to gather the manure. 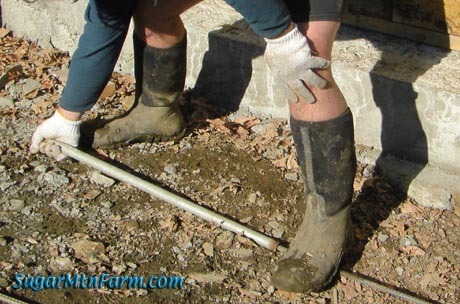 5) We need the nutrients from the manure to return to our soil. If we pass the manure through a methane digester it take out a lot of nutrients leaving the resulting material less useful for fertilizer. 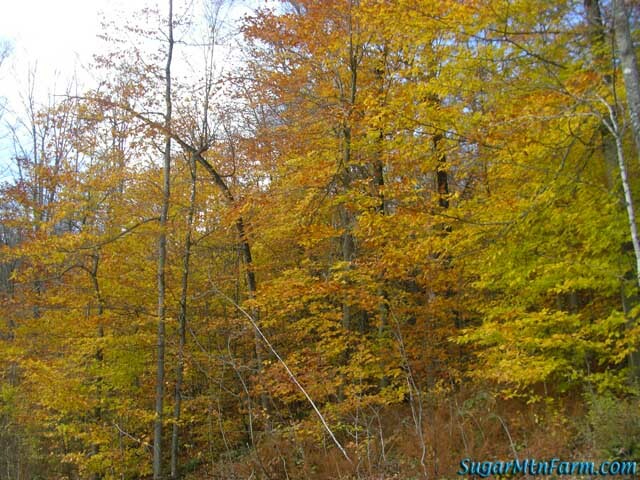 6) We have a lot of readily available wood here for heating our home, cooking, water heating, etc. Ben want to build a wood fired electric generator but I’m a bit dubious of the feasibility of that. 7) We have a good amount of water flowing with a high head (220′) which we can generate clean, simple hydro-electric power more easily than using methane. Methane was one of the several things we’ve looked at for energy including wind, solar, hydro, etc. If the world economy collapses and we need engine fuel I might pull out those plans, or the bio-diesel still plans. There are some very simple designs from third world countries out there on the web. If I was going to do it I would probably do something along the lines of the two chamber design I read of in India. If you do go that way I’ll be fascinated to read about it. Different things work for different situations. 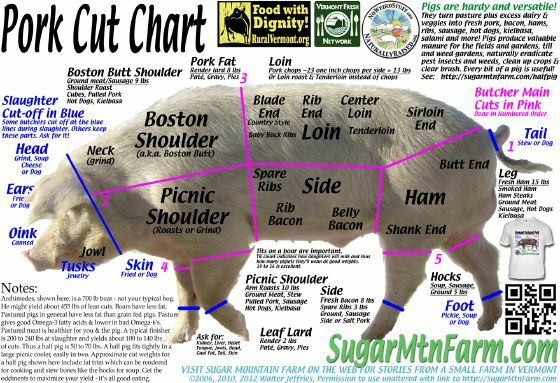 Oops, I meant Methane Pits, not pigs, in #2 above. I suppose a methane pig would be dangerous to enter too. Sometimes the pigs toot too. first, I need a flood hazard permit because i’m in the 100 year flood plain. This requires a survey of my property as part of it, so the permit is only $300, but the survey is $1200 or so, so $1500. Then i need a building permit whos cost is calculated by the type of building and some per-square foot teh county judges its worth. for residential it’s worth $55 a square foot, and the fee is a percentage of that. 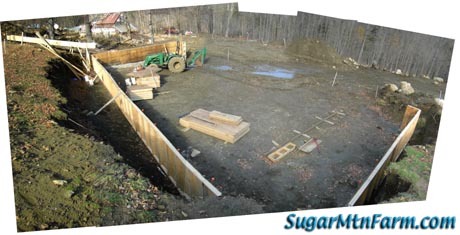 Then I need to have a series of inspections — first before i break ground, then after i excavate, then after I do the rebar woork for the footing, then after I finish the rebar work for the wall, then a final foundation inspection. doesn’t matter if it’s a greenhouse or chicken coop or whatever. Each one requires I stop until it’s inspected, which means I’m working to their schedule, not mine. Then depending on what the upper is, a framing inspection, plumbing and electrical (each of which requires their own permits and inspections). for a greenhouse you’d want to run water — so that’d be a permit. if at any time the county decided that where i was building was a wetland, I’d need a mitigation plan to replace any displaced vegetation, which, by the way, requires a survey that has been delimited by a qualifed wetlands biologist and a plan drawn up by a wetlands biologist. and this applies to any building of any size. There is no minimum size limit. 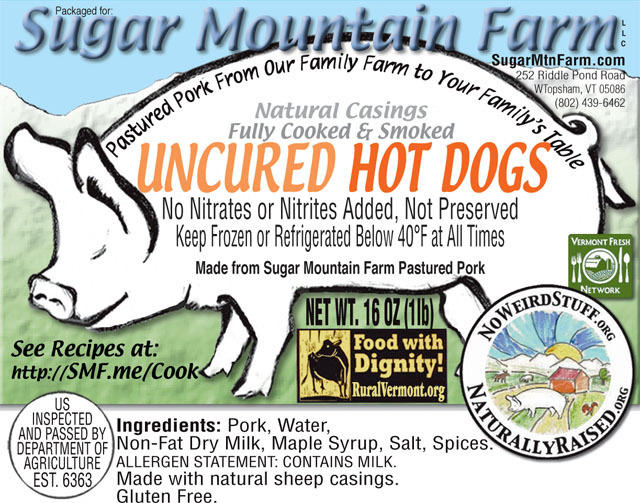 And this is in snohomish county washington that has as part of its county charter that farming is an important activity and should be encouraged and perserved. So the regulatory cost of that building here would be between $2 and $4k. It sounds like your area has a full-employment work program for bureaucrats and their cling-ons. I have heard from people in other states, including Taxachussettes, that they have government make-work programs much like you describe. Sad. We chose where we live in a very great part based on the fact that there is no zoning or building regulations here. We can build how we want. I don’t want some government official telling me what color to paint my kitchen – as I’ve heard they actually have in some places. If you ever move, investigate carefully the regulations and such for the towns where you’re considering re-locating. Now with so much information on the web this has gotten much easier to do. We need less government and more personal responsibility. Fight back and roll back the fascism.